When it comes to anything beyond routine questions, consumers say they still prefer humans over chatbots. But that may soon change. Already more people would prefer to talk to bots after hours instead of waiting for a human the next morning. Strategists in the banking industry must figure out how to balance these attitudes as they increasingly blend chatbots into their retail delivery mix. Use of chatbots in the retail banking sector is still in its early stages. That’s why — at least for the time being — consumers tend to prefer interacting with real human beings over chatbots when it comes to non-routine banking matters. This preference could shift quickly though, as chatbot technology improves. In a survey of U.S. consumers, two facts leaped from the report. 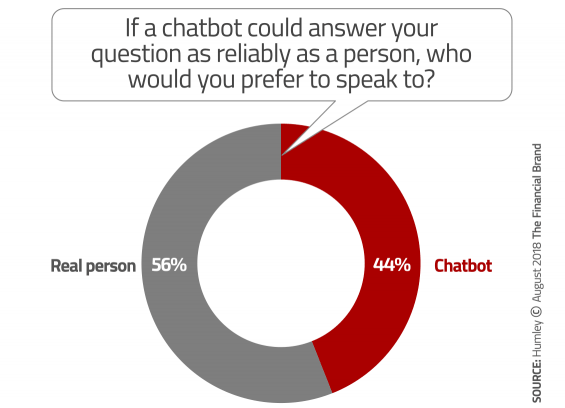 First, more than two out of five (44%) would rather speak with a chatbot than a human “if it could answer your questions as reliably as a person.” Second, a quarter of consumers would switch to a new bank offering 24/7 chatbot support. The statistics come from a study from Humley, a provider of chatbot solutions. The findings should command attention from every retail banking professional wrestling with whether to implement intelligent chatbot technology, and if so, how. Chatbots — automated voice or text response systems — entered the mass market consciousness in a big way after Amazon’s 2016 Super Bowl ad promoting Alexa and its Echo smart speakers. 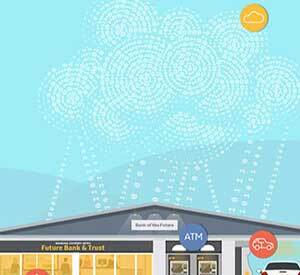 Have financial institutions kept pace? Around that same time, Cornerstone analyst Ron Shevlin was throwing warning signs in front of retail banking strategists. He worries that too many bankers cling to the belief that consumers have always — and will continue to always — prefer in-person interactions for everything. The Humley research confirms that consumers have become much more receptive to digital solutions… if they result in improved service (and that’s a big “if”). Already the application of artificial intelligence software to chatbots has taken their voice and text-based response capability to another level. In some applications — setting up a consumer’s debit card for use in overseas travel, for example — they can outperform human interactions. But will chatbots be able to handle more complex interactions? That’s still an open question, and one reason why some of the largest players in retail banking have followed a measured course, testing and gradually rolling out chatbot solutions. These include Bank of America’s Erica, Capital One’s Eno, Ally Bank’s Ally Assist, and others. One bank taking a different approach is Umpqua Bank. Its “human + digital” banking strategy pairs people with technology on its mobile app. The regional bank allows consumers to use the app to select the representative they want to deal with and communicate with them by text, Skype, phone, or in person. Umpqua is also considering implementing chatbots into the mix as another, more efficient way to handle common questions. 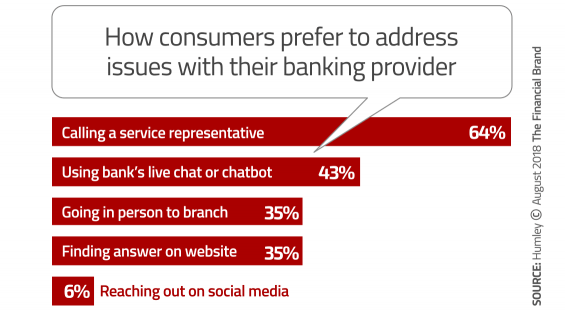 The Humley study revealed that one third of consumers don’t even know if their banking provider has the capability for them to interact using a chatbot or by live chat on the institution’s website. Of the rest of the sample, 45% said they were able to interact with their bank or credit union by chatbot or live chat, while 22% said they were not. Live chat is sometimes viewed as a precursor to fully automated chatbots. 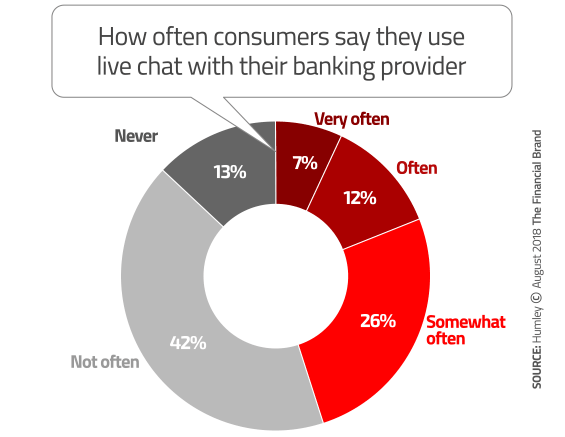 So the study specifically looked at how often consumers use the live chat function to communicate with a service rep at their financial institution. The biggest response was “not often” (42%), followed by “somewhat often” (26%). These modest numbers suggest a missed opportunity for banks and credit unions, considering that many of them already have a call center operation in place. 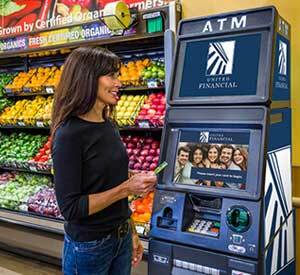 In the future, which method would consumers prefer to use to address an issue or complaint with their banking provider? Almost two thirds said a phone call to a service representative was the top choice. However, 43% would still prefer to use live chat or a chatbot — more than the 35% who prefer going into a branch to resolve a problem. Although the phone is the preferred communication method among respondents for complaints and other issues, people don’t actually call very often. Nearly half of respondents said they “never” call their banking provider to take care of small tasks. Of the rest, 28% call monthly and 6% weekly. The reason, of course, is that consumers take care of small tasks online or on a mobile device. Humley reported that 48% of survey participants access their bank from their web browser weekly, and 36% do so daily. Two thirds of consumers said they would rather wait on hold for a real person than use a chatbot. From these findings, it’s clear that chatbot technology has captured people’s attention as a means to do their banking. For the moment, however, that interest predominantly skews toward off-hours use. When Humley asked U.S. banking consumers if they would rather communicate with a chatbot or “wait on hold for a real person during business hours,” two thirds said they’d prefer to hold. In those consumers’ eyes, banking chatbots are not quite ready for prime time. Keep in mind, however, that one third of survey participants said they would prefer to communicate with a chatbot during business hours than wait on hold — not an insignificant number. Time of day is an important factor here. In a separate question, just over two thirds of banking users between the ages of 18 and 70 said they would rather communicate with a chatbot after hours than wait until the next day to talk to a real person. Clearly chatbots — like ATMs and other earlier banking technology solutions — have great potential to meet consumers’ needs… on their terms, and when they decide they are ready to accept them. While people will wait on hold to speak with a live banking representative, there is a limit to their patience. Humley didn’t specifically ask what that limit was, but did report that one third of Millennials said they had waited 15 or more minutes to wait to speak with a banking representative. That’s like 15 days in Millennial time. And sure enough, 31% of the Millennials polled said they would switch to a financial institution that didn’t have long call waits. 40% said they had switched institutions due to poor service. Among the entire sample of banking consumers, 77% said they would switch to a bank or credit union offering better service in general. The survey results suggest that how that service is provided will likely evolve to be a mix of immediate, actionable information provided by bots, with more nuanced and deeper answers available from humans that have access to the same consumer data and analytics. It’s a moving target, however, and more and more consumers will continue to be open to banking by bot.